EEEK!!! July is here already. As a former teacher for over 30 years, I well remember the feeling that summer was trickling through my fingers! 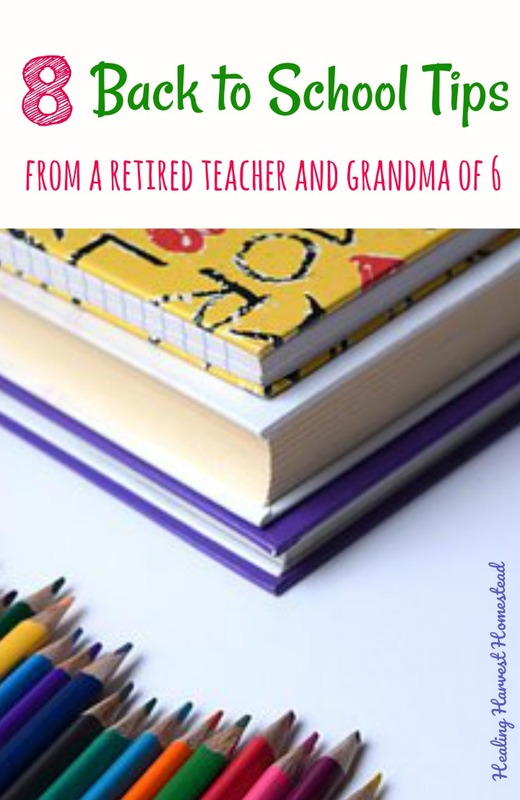 School will be here before you know it, and if you have kids or are a grandparent raising, or helping to raise, school age kids, you know how fast time flies! In fact, for many teachers, there are just two seasons: School days and Summer days. This article is not on my usual topics of homesteading and health, but I am missing the school days. 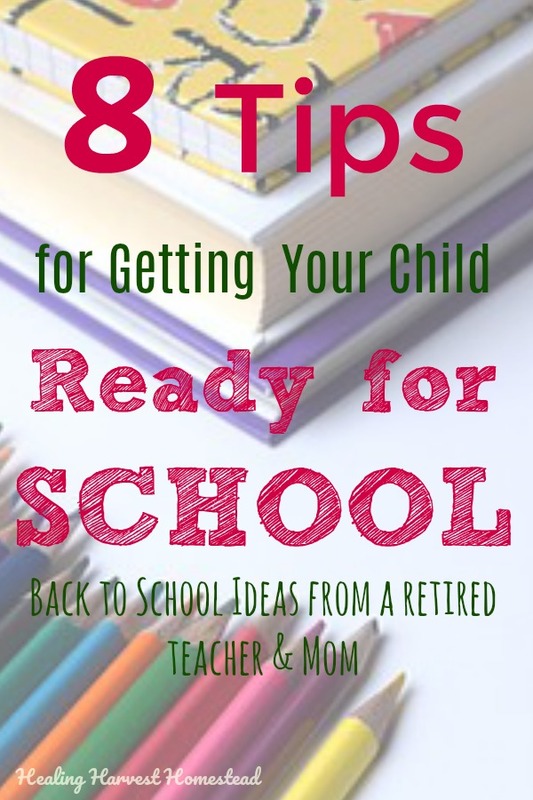 I thought I'd share the wisdom I've gained from decades of being a mom and a teacher to give you some ideas for starting your child's school year off on the right foot! Besides having taught public school for decades, I also raised four children to adulthood, and I've helped in the raising of one of my grand daughters. Many of those years were spent as a single mom, too. I have a LOT of experience with getting kids ready for the school year so it doesn't take you by surprise! Don't let that first day of school sneak up on you this year. Here are some things you can do, some of them right now, to be sure your child is ready to go with a great attitude! FTC Disclosure: There are affiliate links scattered throughout this article. If you click through and make any kind of purchase, I may receive a small commission at no extra cost to you. Even though many children are ready to go back to school, most kids, even if they love school, have a bit of a rough time with the adjustment from the freedoms of summer to the structure of the school day. That first week can be a difficult time of getting used to new teachers, a new schedule, a change of life. And it's not just hard on the kids! It can be stressful for parents too! If you do these things, you're adjustment time (and your kids') will be a lot smoother and easier! Hopefully, you've been having your child read for fun all summer. Or at least reading to your child. But let's be real. Working parents are often relieved that there is less academic work to do with their kids in the summer time. I remember that myself, and I was a teacher! But, as a former teacher, I can tell you that if your child is in the habit of reading (or being read to, if they are young), then that nightly reading work won't be quite so traumatic. Anyway, the goal here is not just practicing reading skills. I highly recommend that this reading time be FUN. Let your child read what he/she wants to read. Comics? How-To books? Chapter books? Young Adult? I say, whatever makes them happy, as long as they are reading what your family thinks is appropriate for them. Reading during off-times, like summer, has a lot of advantages. First of all, it's good for your child to keep learning new things. Reading is one of the best ways for this to happen! Find out what interests your child has, then set up some fun challenges. For example, if your son loves to build things, then find a good how-to book in the library or the bookstore. After the reading part is done, let him go on YouTube to check the advice there against the books. And even better--have him create the project! And talk with your child about the reading in a non-judgmental, relaxed way. Summer reading isn't a time for heavy duty skills lessons. It's a time for gentle, enjoyable practice. When school looms ahead, if your child has had a little practice time in the summer months, going back to skill work won't be too hard. Writing, in my experience, is one of the more difficult skills for many kids. I always suggested to my parents that they get their child a fun journal so they could free-write every day. Just set an alarm for five minutes, so they can get those thoughts on paper. You might be surprised to find that your child will actually enjoy it and write for much longer than that. The key is not to make it a chore or an assignment. You can help with this by modeling writing with your child. Even if your child is in the pre-writing stage, just drawing pictures and talking about them with you will help get their minds ready for this kind of communication. Here's an idea: How about setting up a time each day for the whole family to make a daily "Grateful List." Then you can share one or two things. It's not only a way to practice written communication, it's also a way to teach this important character trait. When your child sees you actively participating, he/she will be more likely to appreciate this time. Good reading habits start young! But it's never too late! About two weeks out from the start of school, it's a good idea to start slowly re-adjusting the family schedule so it matches up with how the school day will be. Usually this means getting to bed earlier, waking up earlier, and getting dinner and bedtime routines back in place after the freedom of summer time. I suggest starting slow. Every couple of days go to bed a few minutes earlier, until the night before school, everyone is in a good habit. I can't tell you how many years I've seen super tired students dragging themselves into the classroom. Either they never did get to have a good schedule, or it took them a good month to settle in to the school year. It's the parent's job to be sure your child is set up for success in school! Sleep is a huge part of that success being able to happen for your child. Help him/her out! You may have to put your foot down, but it will be worth it for everyone. You are what you eat, and good, healthy foods feed the mind as well as the body! This is somewhat related to the schedule, but there is more to this tip than meets the eye. As a long time teacher, I have seen the damages first hand that too much time on the computer, iPad, video game, and now phones, has on children. There has been research conducted that has proven that too much screen time actually changes children's brains! I remember one student I had. He was a very bright 5th grader, had great comprehension and understanding in all content areas, but....he was failing. Why? Well, I sat him down, and we had a talk. It turns out, after school got out he went home where he played video games with his Dad until after midnight every. single. night. This was many years ago, and screen time wasn't even the issue it now has become. But what a troubling conversation that was. Especially because his father was not creating a situation for this young man to be successful. Kids need reasons to succeed, and often those reasons revolve around the value system in the home and the expectations of the parents. Cut back that screen time. Even if it's hard. Your child will have a better life because of it, both in the short term and the long term. The screen is not a babysitter. It's not a teacher. It's not a parent. Kids really need to have imaginative time to think. And guess what? A little boredom is not a bad thing. Boredom often leads to ideas and thoughts! Problem solving! Creativity! So consider reducing screen time to no more than an hour or two (and being the old lady I am, I think that's way too much) a day. Journaling with your child is fun and healthy. Written communication is more difficult than verbal or reading---So get your child in the habit of writing his/her thoughts down, even a few moments a day. Do you remember getting ready for your first days of school? The new backpack? The new pencils and markers? These may seem like trivial things, but it's important for your child to have some supplies of his/her own. Now, depending on the teacher and school, there may be a sharing system set up, and that's fine. It's important for kids to learn to share. However, just being able to show up with the basics is, for most kids, a big deal. Nothing quite beats the special new-ness of a new pack of crayons, right? Take advantage of the school sales! I always bought extra packs of the pencils and markers I wanted kids to have on hand, for the students whose parents either couldn't or wouldn't buy them. If it's within your budget, perhaps consider purchasing a couple extra packs of paper or markers for the teacher to share with other kids. Also, the very act of shopping for school supplies helps gets kids' minds ready for that first day. There is usually an innate sense of excitement in buying new supplies. Take the backpack, for example. A backpack is kind of a big deal for kids. It tells about the child's personality! It's fun to have a special place to store your very own things. So make the school supply shopping fun. And if you do it online, have your child participate there, too. They'll love spending that time with you. There's just something so special about new school supplies. Shop those back to school sales! You know. I really don't care about this aspect of getting ready for the school year, but for kids, it's kind of a big deal. It's about having pride in taking care of his/her personal self, too. It's learning to show up clean, every day. And that is definitely a learned skill. Help your child with this part of going back to school by taking a good look at hair, overall cleanliness and hygiene habits, clothes, and shoes. Make that effort to talk with your child about the importance of bathing. Go get that haircut, or cut it yourself if you can. Clothes for kids are expensive. I know this. Raising four kids on a teacher's salary was really tight. But I found some really great things in thrift stores! And the back to school sales can be pretty amazing! Set a little budget, and try to get your child a new outfit or two for those first days of school. It just makes things a little more special and less stressful if they know they look clean and good. 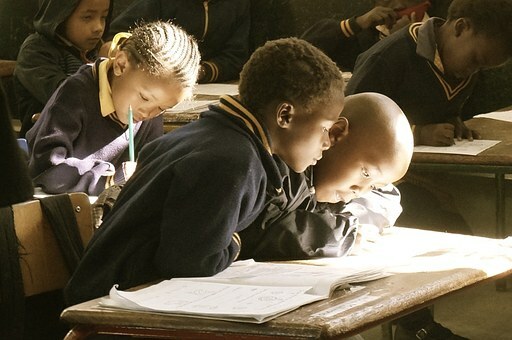 I once taught at a school in an extremely poverty-stricken area. It was so poor, many of the trailer homes should have been condemned, and I'm not kidding. But the school was such a great community for those students. The more well-to-do parents, the teachers, and the staff of the school created a special room called The Sunshine Room. Struggling parents could just come to the school and mention the Sunshine Room and their needs, and guess what? The kids were taken care of. Now, you may not have access to this kind of resource, but there are many ways to get those supplies and clothes your child needs. Be on the lookout for churches, community events, and other resources where you can get the help if affording school items and clothes is a problem. If these things are not a problem for you, that's wonderful! Maybe consider splurging a bit right now! Make this a fun and special, exciting time of the year! Kids spend a lot of energy on brain power! These Back to School Tips will help them have healthy bodies and minds! 6) Show UP, and Be Present! As a teacher, I just can't tell you enough how important this tip is. It's the MOST important piece in helping your child be a great student, if I had to choose just one. Your child notices when you are there. He/she knows when you're not. Kids know when you care, and they know when you don't. Please be present for your child(ren). Go the the Open House with a great attitude! Show up to the Academic/Art/Music/ or whatever programs. Your child may not say so, but they appreciate when you're there. They know when you want to support them. They know if you think school is something important....or not. I know that work for some parents gets in the way of being there for everything. I really understand. With four kids on different schedules, I was run ragged half the time. I know how that is. You may need to make choices about how your time gets divided up. But if you can't be there for an event, be sure to talk with your child about why. Be sure you explain that you WANT to be there, but this time you just can't for whatever (good) reason. I'm not here to lecture, but I've seen too many kids over the years who didn't do as well as they could because they didn't think school was important. And why not? Because their parents didn't think it was important. Learning and progressing and expanding and growing---that's your child's job right now, and it's up to you to help them as much and in every way you can! Right? Spending a little time every day will do wonders for that love of learning! Does your child know what you expect out of him or her? Do you have stated expectations for behavior? For learning? For achievement? If you don't know or haven't decided upon some strong expectations and boundaries for your child in these areas, chances are decent that as he/she grows into the pubescent years (and most likely even earlier), they will stop trying for the sake of the teacher. All kids are different, and all kids need to have expectations that meet their needs. But in our home, I knew my kids were all capable of getting good grades. Period. I also didn't have time to be that "Hover-craft" parent. By the time they were in third grade, they knew that it was on them to ask me for help if they needed it. I stopped going through their backpacks. They learned to be responsible by about the age of 8 or 9. My kids loved sports, playing them most of all. They were all on teams of various kinds from the time they were four all the way up through high school. This was because I had a personal belief that being in sports creates an environment within the school of high expectations. You can't play a sport if you have bad grades and aren't into achieving. So at an early age, they knew if they earned a grade lower than a "B" that their sports time would be affected. They might sit out a few practices or even a game---They disliked this SO much that it only took one time for my oldest to test the waters, and none of them ever had an issue again. Another thing about setting expectations is you get to talk about achievement with your child. Most adults want to progress to a certain level, and kids see this too. I remember this lesson well from when I was still a student. I think I was in about 7th grade, and I was having a talk with my Dad. My Dad asked me, "So, what kind of grade do you think is good enough for you?" I replied that I thought a "B" was just fine. Well, then my Dad said, "Then you'd better shoot for the "A"." Do you know why? His theory (and he was right) was that if you shoot for the higher goal, you may just miss it. And that's ok, because you'll still be close. Good advice, right? At any rate, the expectation should be to "Always do your best, and do it right the first time." Having discussions about expectations for grades and behavior is a way to get your child ready for the school year, too. Be firm, but kind. I have to be very careful with this subject, because I could go on a long rant. All I am going to say about this tip for getting your child ready for the year ahead in school is that it matters what he/she eats. Absolutely, it does. Try to wean your child off the processed foods, if they are addicted. Let the sodas go. Be a good role model yourself, in this regard! It's the best thing you can do for you, too! Teach your child good eating habits. Lots of vegetables, some fruit, and clean, unprocessed meats. But what about the cost? I know it seems like it's more expensive to eat healthy foods. But with careful planning, it's not that hard. The key is planning. Look online for healthy, local food options. Bountiful Baskets is a great source of healthy food for low prices. Shop seasonally. Learn to cook from scratch. I remember my kids accusing me of being a "health nut," but they all eat healthy now, as adults. And that's because of the hard work we all did to learn these patterns when they were children. As for my students, those children who eat a ton of sugary, processed foods are not as healthy, have higher rates of illnesses and issues such as asthma, and are either tired and lethargic or bouncing off the walls. Diet matters. You can find out What Foods You Think are Healthy But Are Really Killing You in this article. Or find out How to Eat Bad, Better, and Best in 9 Different Food Categories. These will get you started! Teaching your child good hygiene habits and dressing skills will help everyone out. Hygiene & appearance is part of the social skills kids need to learn to be ready for school. There's a lot that goes into being a great parent. There's a lot that goes into being a good student, too. It pays to be proactive and help your child be ready for that exciting first day of school! If you're excited, they will be too! Your modeling of thought patterns and behaviors is one of the most important things you can do to help your child in all ways. Why not put a plan together now, so that when you're about two weeks out from the start of the school year, you and your child are all ready to go! I'd love your thoughts, questions, comments in the comments section! 7 Ways to Clear Up a Stuffy Nose & Nasal Congestion FAST! Hugs to You! I hope your school year is Incredible!! P.S. If you haven't already, I hope you'll sign up for our complimentary newsletter! You'll never miss a thing, and I'll be sending you three eBooks FREE too. One is on essential oil blends, anothe is about using herbs to relax, and finally one is about getting your own homestead started no matter where you live.